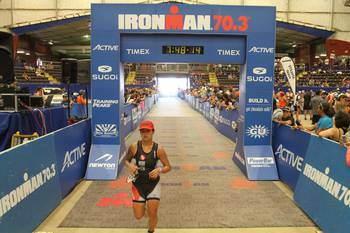 I used an 18 week Half Ironman – Intermediate plan by tri-newbies, which I had used for my previous race. The plan recommends three workouts per discipline each week, which ramps up to four workouts each week per discipline when you get closer to the race date. Due to life, work, mommyhood, and such, I rarely completed all the weekly workouts. Knowing that my knees and IT band needed a little extra frequency, I decided to amp up the running at the end of the plan so that I would peak at a 14 mile long run prior to race day. I had some challenges getting my new tri bike (Blue Bike Triad EX) custom fit down to size itty-bitty. Thanks to my hubby, a great friend, and some nifty tools, we were able to get it to fit like a glove…. 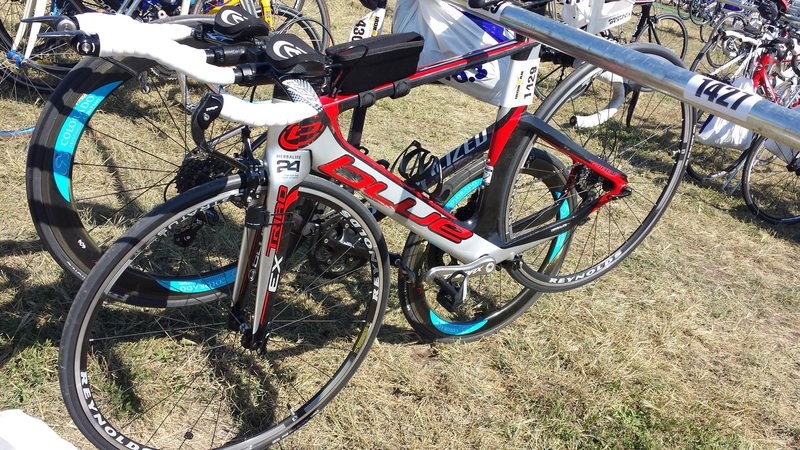 well, as comfortable as you can get a tri bike to fit. 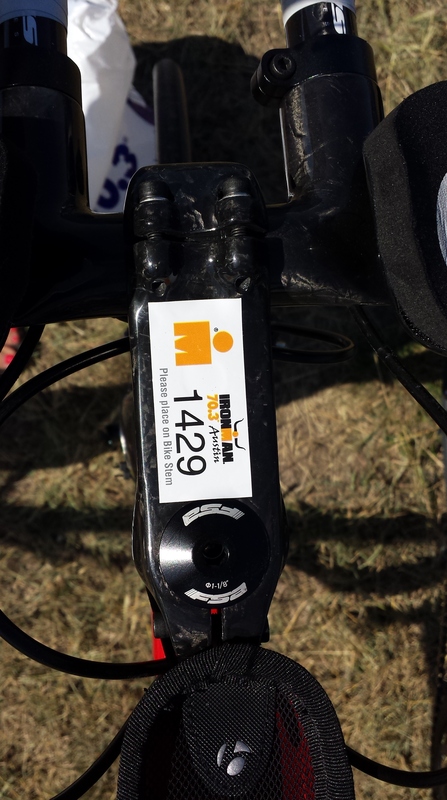 Due to time constraints, this also meant I would get less than half a dozen rides on the new bike before race day. 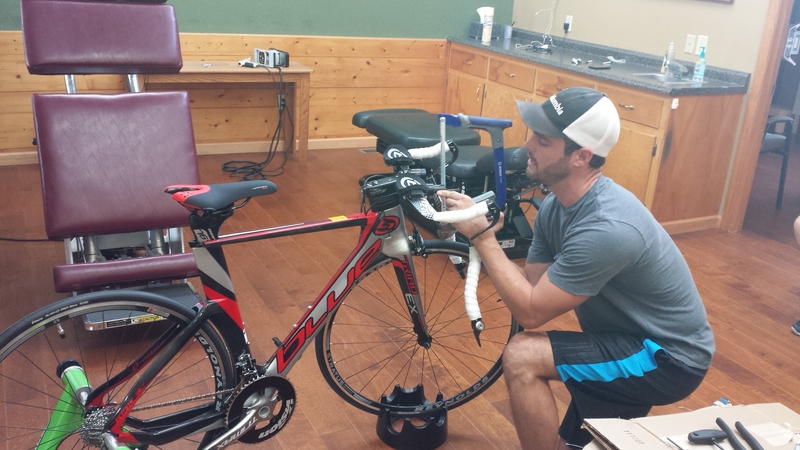 Going from a road bike to a tri bike is like going from an automatic transmission to a manual…. the brake stays in the same place, but the way you shift gears is different. Nobody told me how wobbly I was going to be either and that felt like a cruel joke the first couple of rides. About two weeks out, I was super excited to begin the taper. I nailed the first three days of workouts on the taper….. then, my wonderful 4-year-old passed on a head cold to me which had me out of commission. Instead of a taper, I was resting completely and had no appetite. Four days before race day, I managed to get myself back in the pool for 20 laps, in which my ears kept popping from pressure and I almost talked myself out of the race. Thankfully, another mommy-friend-amazing-triathlete was in the pool with her daughter and manage to talk some tri-sense into me, which is probably the opposite of actually making logical sense. Thursday night: Pack race gear. Friday morning: pack nutrition, clothes, get kids ready and off to school. Drive…. drive through Georgia, into Florida, across a time zone, into Alabama, Mississippi, through Louisiana (when did they get so many outlet malls? ), and into Texas. 800 miles later… arrive in Austin, Texas just after dark. Check in to hotel (I stayed 7 miles away from the event, not in the host hotel), bring bike inside and pass out. Saturday: Attempted to sleep in… efforts were futile since I was so darn excited about the event. Went to hotel conference room for the complimentary breakfast and steered cleared of what was supposed to be scrambled eggs. Now was not the time to brave questionably cooked food. Head off to the Expo to check in for event. Things were cool until I got about 2 miles away from the Expo. All of a sudden I saw them and they were everywhere… people in tri suits cycling, running, sweating, and looking far more fit than me. I started to get anxious…. I didn’t plan on working out today and I sure didn’t bring my gear with me to get a quick brick workout in. After parking, I headed over to the “village” and got in a long line for packet pickup. Standing in line solo gives you lots of time to eavesdrop on everyone’s conversations around you…. eavesdropping was not my intention, but I couldn’t help it… I heard from nutrition experts, seasoned veterans that were scaring the newbies around them, and the families with kids (who of course were bored)…. which made me miss my family. 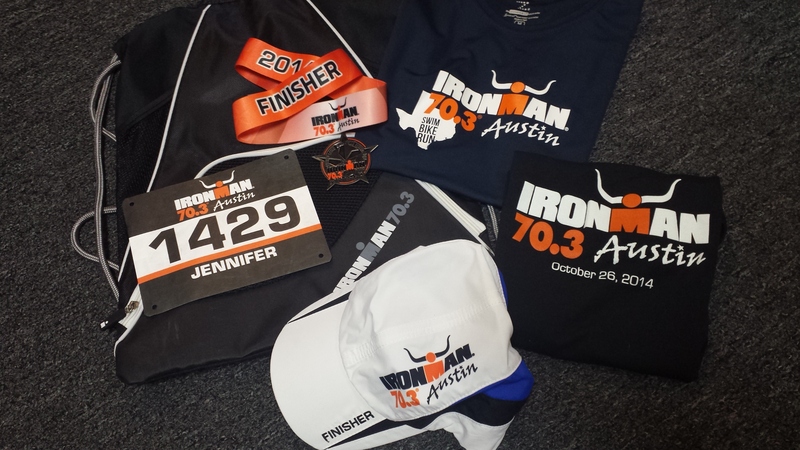 Picking up your packet at an IRONMAN event is actually pretty cool. You go through different stations… first, pick up and sign waivers; second, pick up race packet; next, pick up goody bag; last, pick up timing chip. After I checked in, I hunted down a childhood friend of mine that works for IRONMAN and holy cow was it weird to see him with facial hair and then he had to point out the gray hair…. glad I hadn’t aged at all in the past 20 years! (isn’t weird how your friends are not supposed to age from the last time you saw them). 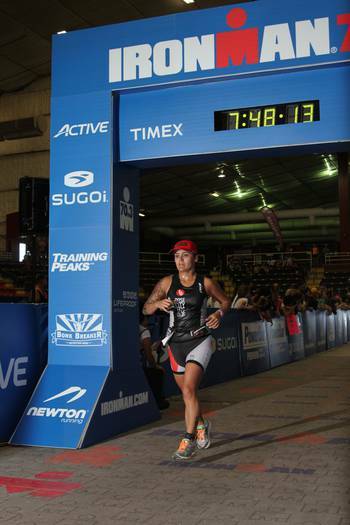 The Expo was full of stuff that every triathlete “needs,” like the new doo-hicky, new hydration contraptions, clothes, more clothes, and running shoes galore. I picked up a few shirts and then drove a mile down the road to Transition 1 (T1) to drop off my bike and bike gear bag. I had read on a Facebook post by a veteran racer to carry my bike over the grass so that I would not get a flat tire from the thorns in the grass. I did so diligently and noticed a few others doing the same. After racking my bike at my assigned location, I walked down to check out the water for the swim. 1.2 miles in open water looks way different than 35 laps in a pool. 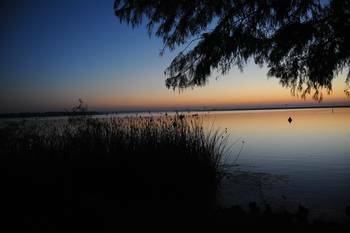 The water temperature measured 74.3° F, which meant it would be a wetsuit legal swim…. woohoo! After the Expo, I found a Mexican restaurant for a pre-race ritual: chips, salsa and a tasty burrito. 4:00 am: Alarm goes off…. like I needed it. Do you really think I slept???? Gear on, pack car, drink a few sips of coffee, go to the bathroom, brush teeth, double check all is packed and head to race venue. 5:15 am: Arrive at race venue, drop off running gear bag in T2, get on bus to travel to race start. Get body-marked, check on bike to see that it is still there, go the bathroom like 10 more times and try to convince myself that I did got some sort of stomach bug from that Mexican restaurant (because it couldn’t possibly be nerves). Place nutrition on bike (2 bonk breaker bars, 2 pieces of gum, 2 water bottles with Herbalife Hydrate, 1 bottle with just water, as recommended by my dentist), and rub BodyGlide on my body like it was going out of style. The frenzied excitement of all the athletes was more than I could take and so I crept off to a quiet place under a street lamp to call my hubby and text a few friends. A few athletes found their way over to me and sat down and they were so mellow it was like they weren’t even at a race. After talking to them, I realized that they were pro’s and talked to me like I knew what I was doing. I figured their cool mellowness would rub off a little… at least until my toes hit the water. I HATE THE SWIM. 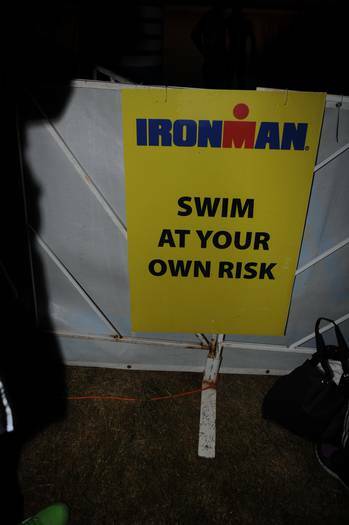 Minutes before every triathlon I am always wondering to myself why the heck I sign up for these things when I have to deal with the anxiety of the swim…. 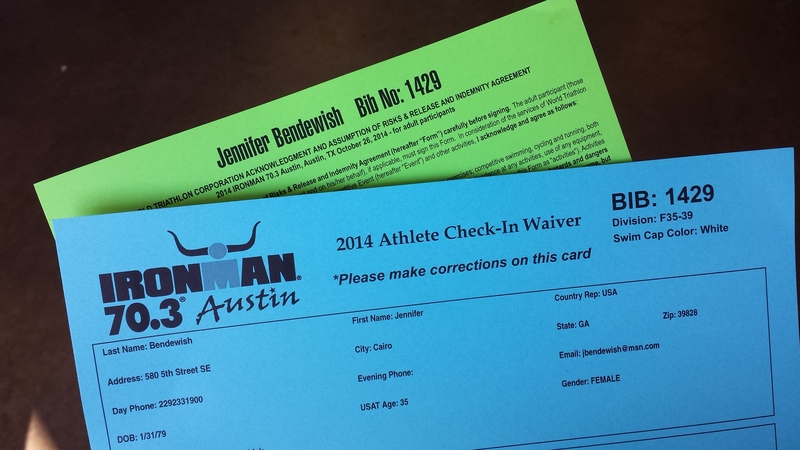 I hope I don’t drown, I hope I make the cutoff time, I hope I remember how to swim… I was in the 11th of 20 swim waves. I ended up talking to a few ladies around me and I am sure they could see the look of dread on my face. We waded out in the water and swam out to the swim start where we treaded water for three minutes. I stayed at the back of the pack and I heard two women giving each other a pep talk and at that moment I realized that there might be someone in the water more freaked out than me. As I looked at the swim ahead of me, I told myself it was no different than a 30 lap workout: 10 lap warm up to the first orange buoy, 10 laps in my comfort zone to the second orange buoy, and then swim all out for the last 10 laps. When we heard the horn blow, I just started swimming. I was actually very comfortable and found myself passing a few ladies. There were lots of yellow buoys on the course, which made for easy sighting. After rounding the first orange buoy I woke up my legs and started kicking. I noticed I had caught up to swimmers from the swim wave before mine, which was a first time experience for me. The men from the swim after me caught up to me and I did get kicked and pushed, but did not panic. After rounding the second buoy, I attempted to swim in my comfort zone, but kept getting off course. I had moments where I was all alone and realized I was swimming in a completely different direction. I did hear a guy in a canoe yell “200 meters, 200 meters” and managed to swim the last 200 meters strong. When I got out of the water, I looked behind me to see how many people were still in the water and I was amazed to see all those bodies in the water (even though there were many swim waves behind me). 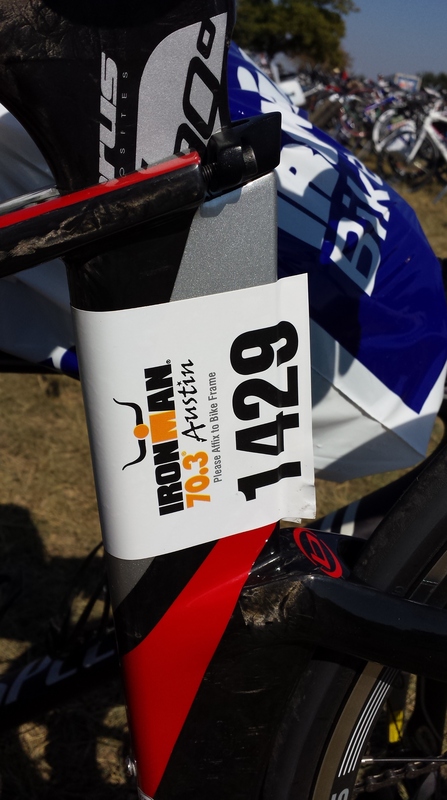 My wetsuit was peeled off by a young gal (thank you) and I headed to transition. I went straight to the porta potty to empty my bladder (wise decision). Strategy: Quick, but not rushed. Stuffed wetsuit, goggles, & swim cap into bag. Helmet on, wipe feet with towel, then put on socks and shoes. Chapstick, gum, lift bike and carry it out of transition. The temperature at the start of the ride was already in the mid -60’s. I had to force myself to take it easy and stay around 14 mph for the first couple of miles. I felt like I was standing still when so many people went flying by me. I started counting all the people with flat tires and counted 22 people within the first 6 miles of the ride. The thorns in the grass really did cause flat tires. Around mile 5, I felt pretty warmed up and picked up the pace. I have a very simple computer on my bike and it read average mph throughout the ride. I had trained around 16 – 17 mph, so my goal was to keep it in that zone and to make sure I kept my heart rate down. The bike course turned out to be one of the funnest rides ever. The course is the opposite of flat, fast, and smooth. It was curvy, hilly, the texture of the pavement was constantly changing, there were road hazards and pot holes everywhere. The rough road sections claimed water bottles, sunglasses, and tire tubes. Flying through downhill sections on rough pavement felt like my brain was being rattled and I could barely see straight, which almost felt like I was mountain biking. It was awesome! There was a water stop at mile 25 and coming up to the stop, I attempted to reach behind my seat and grab a water bottle. Having less than six rides on the bike, I was way too wobbly to attempt this and pulled over on the side of the road to switch water bottles. I ate a bonk breaker bar at mile 20 and mile 40. The last mile marker I saw was at mile 45 and I was surprised that we only had 11 miles to go. The last several miles of the ride had a few gargantuan hills, which I know I pushed it a little bit hard on. Near the top of each hill, I had to stand up on hammer down on my pedals, using more muscle power than I wanted. The end of the bike leg is uphill and after getting off the bike, the 85°F temperature hit me. I jogged with bike into T2. 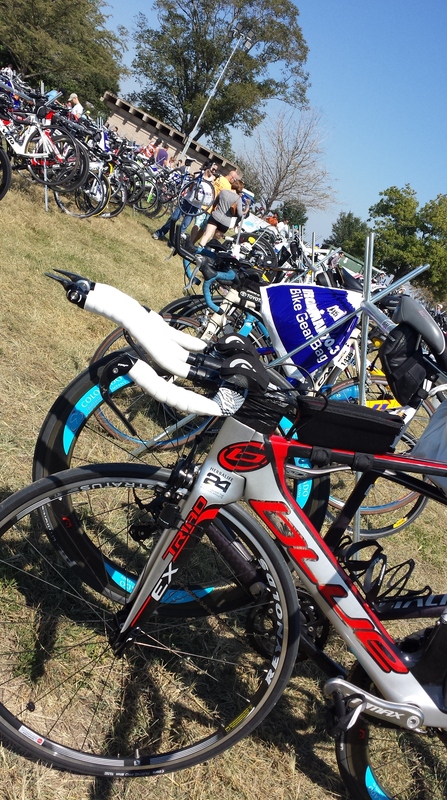 Racked bike, put on running shoes, race belt, hat, and stopped by some guy who was spraying sunblock. Sprayed myself down and ran out of T2, which was uphill yet again. This is where things unraveled a little bit. The run starts uphill and consists of 3 loops, in which you are constantly climbing hills. My legs woke up at mile 2, but at mile 3 the dizziness hit me hard. My legs felt great, but I couldn’t see straight. I slowed down to a walk and felt a wave of nausea come over me. I started to think my race was over since there was no way I could endure 10 miles of this. I stopped at the next water station for a sip of X2Performance, half a pretzel, ice, cola, and water (I used this strategy at every stop until the end of the run). I put the ice in my shirt and in my hat. This provided some serious relief and I was able to run the downhill sections and walk the uphill sections like this for the rest of the 13.1 miles. 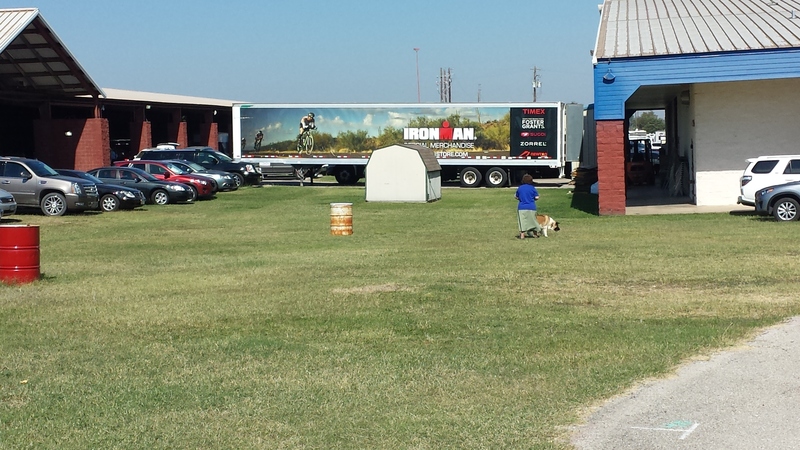 On the second loop of the run, I made sure to stop and use the porta potty. I saw several people laid up on the side of the road waiting to be picked up by first aid in golf carts. I also witnessed a man diarrhea on himself; he had made it to the porta potty, but they were all in use and I was definitely feeling for him. I stopped and walked with a woman who was crying because her stomach hurt so bad and she thought her race was over. I gave her my cup of ice and I was very glad to see her running on the next loop. I saw one person collapse on the course. The last loop felt like the home stretch and I tried to run more than walk, even if my run felt like a walk. Whenever I looked up at the people in front of me, all I saw was walkers. Hundreds of us were walking in the 88°F hilly course. I jogged the last mile and enjoyed the finish, which happens to be indoors. After the race, I grabbed a soda and soaked up the finish line moment and talked to other finishers. Most people I talked to said they would never do another one. After chatting, I headed out to the T2 and retrieved my bike and three bags. I had the luxury of cleaning up with baby wipes, changing in the backseat of the car, and got on the road to drive 300 miles to Louisiana, a little less than halfway home. I made it home on Monday, just before lunch and the soreness didn’t catch up until Tuesday. I did not get near the amount of swim workouts in that my plan called for. I did focus on doing longer swims and used FINIS agility paddles to work on strengthening my pull. I believe that this helped significantly on my swim. One month before the race, I did the Albany Nut Roll Full 100 Mile Century Ride, which was HOT (over 90 degrees the last 30 miles and humid). From mile 88 to the end I was almost crying because I was hurting so bad. I do believe this contributed to mental conditioning for the Austin heat. I’m not sure of what I could have done to have prevented the run experience I had. I was sick a week before the race and was not eating near the amount of food I should have and it is very possible this affected me at the run. 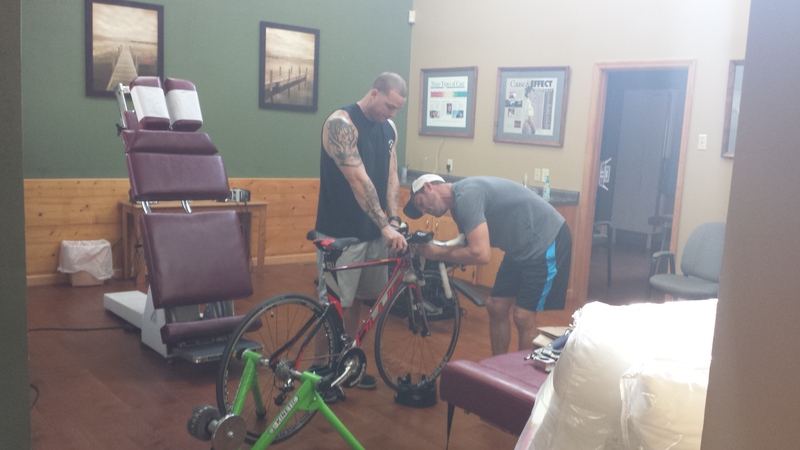 I plan on getting more familiar with the bike and to do some speed work starting in January. I also need to run in the afternoons and not first thing in the morning. Wow congrats that’s amazing really. I always hate the swim leg too. Haven’t done this distance though-impressive. Your bike time is really great. Thank you! I can’t wait to do another one. I have problems! It sounds like you had a pretty tough, mental race but you pulled off a good race.